According to McNab, Barnard Public Safety officers have approached him three times in the past year, once at Columbia. Content warning: This piece includes graphic description and a video of a physical encounter between Public Safety officers and a student. Editor’s note: Alexander McNab is a staff writer for the Eye, Spectator’s long-form magazine. He has no personal connection to the writers of this piece. According to McNab’s account, after he entered the gates, an officer followed him into the Milstein Center, continuing to request his ID, and when McNab declined, more officers were called to the scene. Multiple videos taken by witnesses show that, after trying to compel McNab to leave the building, two officers physically pinned him down to the counter at Peet’s Coffee, after which he handed them his ID. “I didn’t violate anybody; get your hands off of me,” McNab can be heard saying repeatedly in the video while the officers hold him down. “Let’s walk outside,” one officer said in response. McNab clarified with Spectator that he wanted to stay inside the building so that witnesses would be able to see and corroborate what unfolded. The officers confiscated McNab’s ID, saying they needed to verify that he was an “active” Columbia student. A total of at least six officers surrounded McNab by the end of the incident. In the video, Public Safety officers said they followed McNab because he ran past a Public Safety van and through Barnard gates without showing his ID to the officer, and continued running across the lawn. However, both McNab and multiple witnesses at the scene corroborated that he was walking at a normal pace when officers began to follow him. Concern over Public Safety’s relationship with students of color came to a height at a recent Barnard Student Government Association meeting in March, where representatives said to Public Safety Executive Director Antonio Gonzalez that there have been multiple incidents of officers catcalling or harassing women of color on campus. While speaking to SGA, Gonzalez emphasized that Public Safety officers act as civilians on campus and have no authority over students that is comparable to that of the New York Police Department or any other police force. According to McNab, Barnard Public Safety officers have approached him twice in the past year, both times when he was in Barnard Hall for dance practice. McNab claimed that the first time, Public Safety requested his ID as he was leaving the building, and the second time, he was drinking water at the water fountain barefoot during rehearsal and Public Safety wanted to verify that he was not a homeless man. Barnard declined Spectator’s request to provide further comment regarding these accounts of the conduct of Public Safety officers. “Because of all of that, I said ‘Nah, that’s not happening again this time,’” McNab told Spectator in regard to showing his ID. Even so, McNab emphasized that the physical nature of the encounter shocked him. “It’s like I was resisting arrest or something. It was very much like an NYPD police officer-type interaction,” McNab added. According to witnesses, when students approached Public Safety officers to correct their view of McNab’s actions, clarifying that he had not been running away, the officers also responded negatively. Hassan’s account was corroborated by Caroline Cutlip, BC ’20, who witnessed and filmed the incident. In a statement sent to students on Friday morning, Barnard President Sian Beilock expressed “deep regret” aboutfor the “unfortunate incident,” which she said “raised concerns about our safety and security policies and how they are enforced.” However, Beilock did not specify any details of what occurred during the incident. The statement also added that the college is hosting a listening session at 5 p.m. on Friday in the James Room in Barnard Hall with representatives from Public Safety, the deans of the college, the Furman Counseling Center, and the Office of Title IX and Equity to garner student feedback. 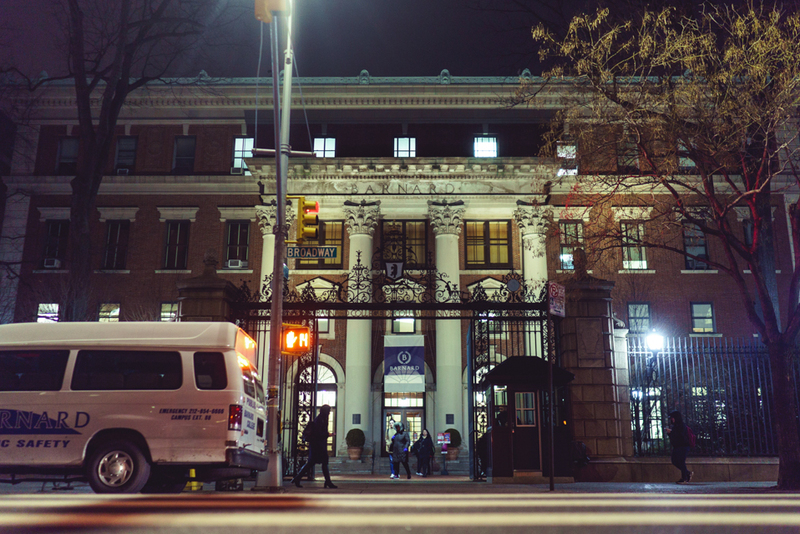 In an earlier statement to Bwog, a college spokesperson emphasized Barnard’s commitment to the safety of students, reiterating the college’s policy that students show IDs after 11 p.m., but did not reference the conduct of the Public Safety officers. It is unclear if any disciplinary measures will be taken against the Public Safety officers involved in this incident, but the college said it is currently undertaking a “thorough review” of Public Safety officers’ actions. A number of Barnard student witnesses have submitted reports to the college’s Office of Title IX and Equity with accounts about the incident. Information about Columbia’s Counseling and Psychological Services can be found here, and about Barnard’s Furman Counseling Center here. Director Molree Williams-Lendor of Barnard’s Office of Title IX and Equity can be contacted at mwilliams@barnard.edu.